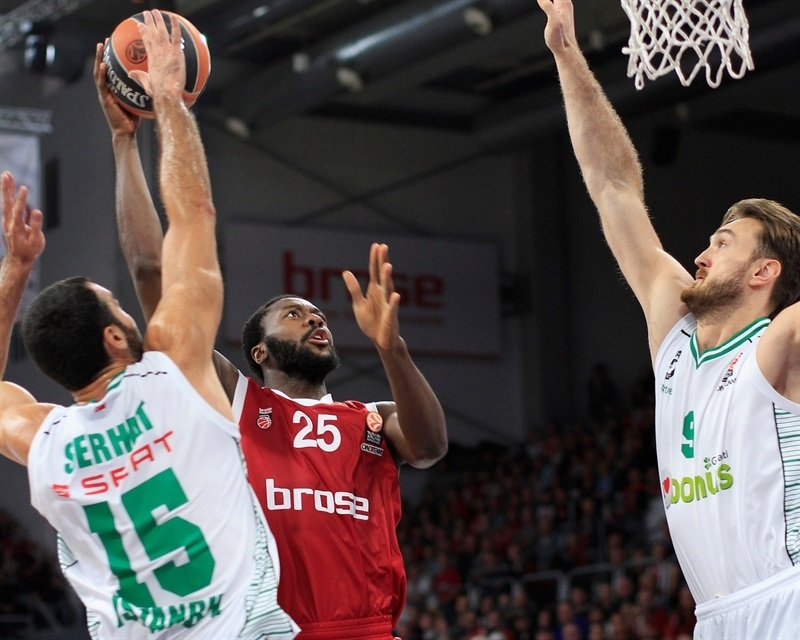 Brose Baskets Bamberg used a balanced attack to pull away early and hold on late to beat Darussafaka Dogus Istanbul 86-76 on Friday night at Brose Arena. The victory vaulted the hosts to 1-1 in Group D and dropped the visitors to the same record. 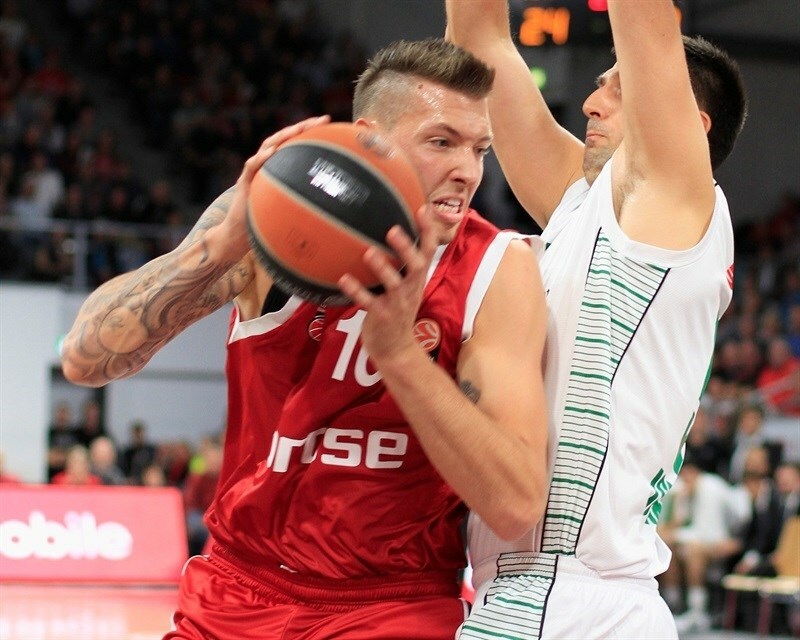 Daniel Theis threw down four dunks in a 10-0 second quarter run that put the hosts ahead 36-22. 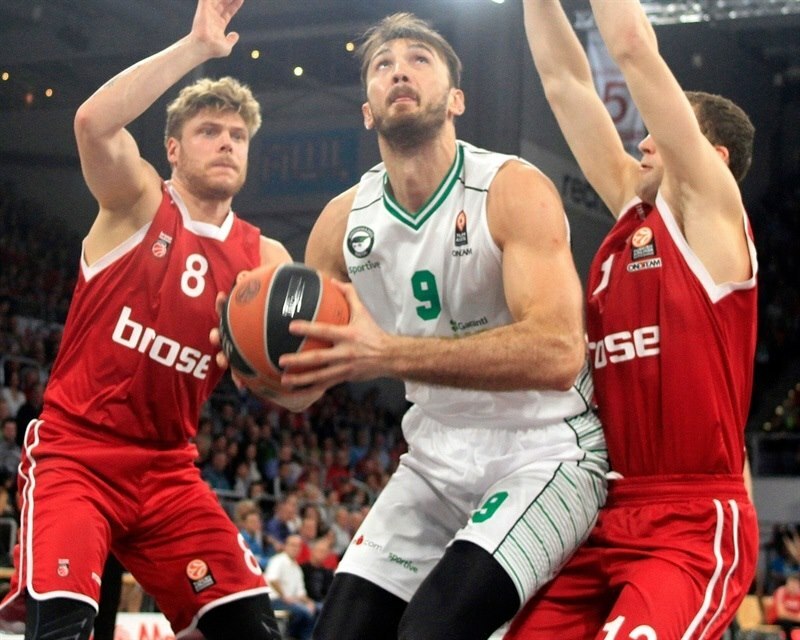 Darussafaka came back to within 9 at halftime and cut the deficit to 7 in the third quarter, but a Janis Strelnieks triple capped Bamberg’s 9-0 response and the hosts remained in control the rest of the way. Darius Miller and Strelnieks paced the winning attack with 13 points apiece, while Elias Harris and Brad Wanamaker netted 11 points each, Nikos Zisis scored 10 and dished 5 assists and Nicolo Melli contributed 8 points and 8 rebounds. 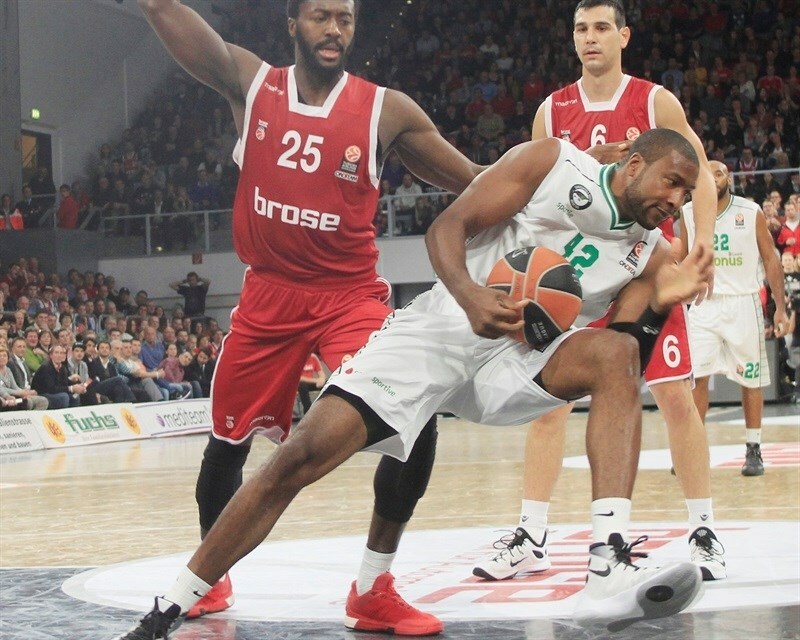 Milko Bjelica led Darussafaka with 16 points and Serhat Cetin, Jamon Gordon and Ender Arslan added 12 points apiece in defeat. Neither team scored on its first two possessions. Darussafaka broke through first on a Jamon Gordon jumper. Darius Miller started things for the hosts with a triple. 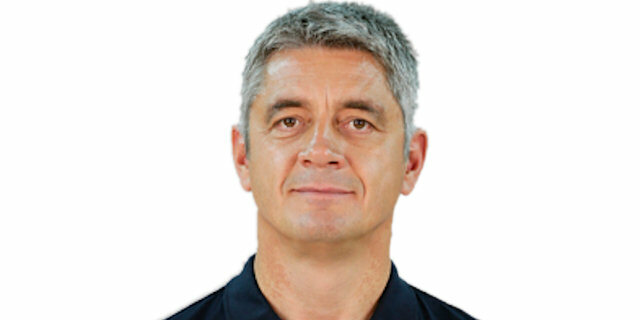 Gordon matched him with Darussafaka’s first three-pointer. Nikos Zisis drove into the paint to tie it at 5-5. Serhat Cetin came off a screen to drill a three and put the visitors back ahead. Nicolo Melli spotted Elias Harris for a short jumper to make it 7-8 midway through the quarter. After the TV timeout, Brad Wanamaker dished to Harris for a two-handed jam. Cetin responded quickly with his second triple, but Wanamaker tied things at 11-11. 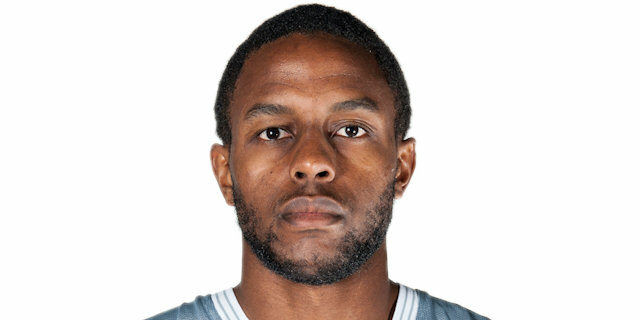 Gabe Olaseni put Bamberg on top again. Zisis heated up with free throws followed by a three-pointer to make it 18-12. Janis Strelnieks drove and created space for Olaseni, who took the formers pass and converted a layup. Semih Erden split free throws to make it 20-13 after 10 minutes. Milko Bjelica went inside for a turn-around jumper for Darussafaka. Strelnieks countered with a layup, but Cetin’s next three-pointer drew the visitors within 4. Reggie Redding’s steal and layup made it 22-20. Miller revived the Bamberg attack with free throws and Wanamaker added a jumper. Former Bamberg player Marcus Slaughter came in and made 2 free throws. Zisis floated a pass that Daniel Theis detonated with an alley-oop slam. Zisis and Theis teamed up for almost the same play to stretch the lead to 8. Then it was Melli who found Theis for a two-handed slam. After Melli added free throws, Theis broke free on the offensive glass for a follow slam to cap a 10-0 run that made it 36-22 in which he dunked four times. Oguz Savas ended the Darussafaka drought with free throws and Gordon added a three-pointer to end the half with his team down 36-27. Wanamaker drove for a layup to restore a double-digit lead. Cetin’s jumper and a Gordon layup got Darussafaka going. Miller countered with a basket-plus-foul, however Luke Harangody got on the scoreboard for the visitors with a reverse layup. 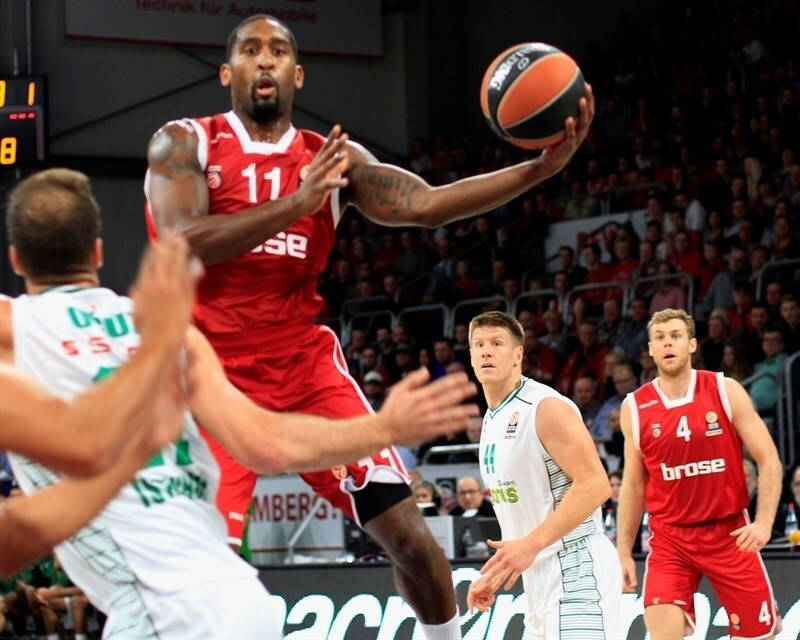 Harris wowed the crowd with another alley-oop slam, but Emir Preldzic’s triple kept Darussafaka in the hunt at 43-36. Melli dunked on the break before Harris flashed another incredible dunk and made the free throw that came with it. Strelnieks finished a break with a layup to cap a 9-0 run that made for a 14-point lead. 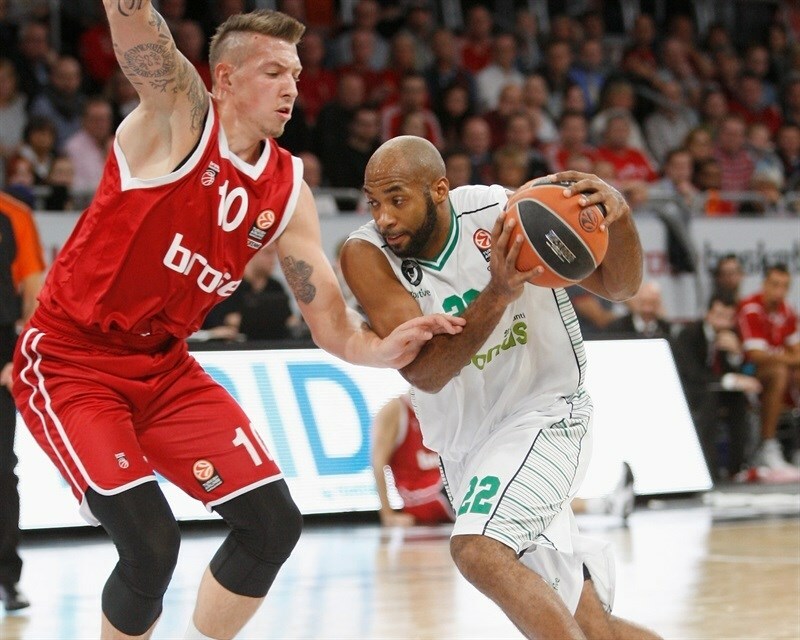 Erden scored inside for Darussafaka, but Lucca Staiger’s three-pointer kept Bamberg in control. 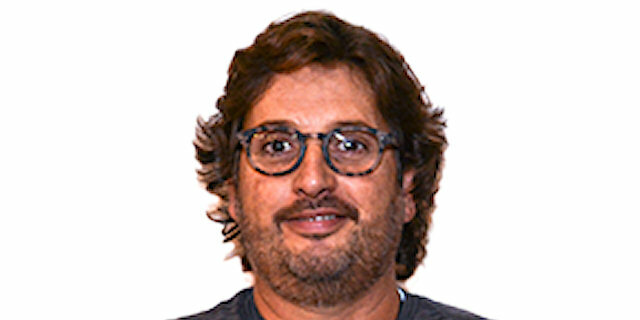 Milko Bjelica and Harris traded baskets. 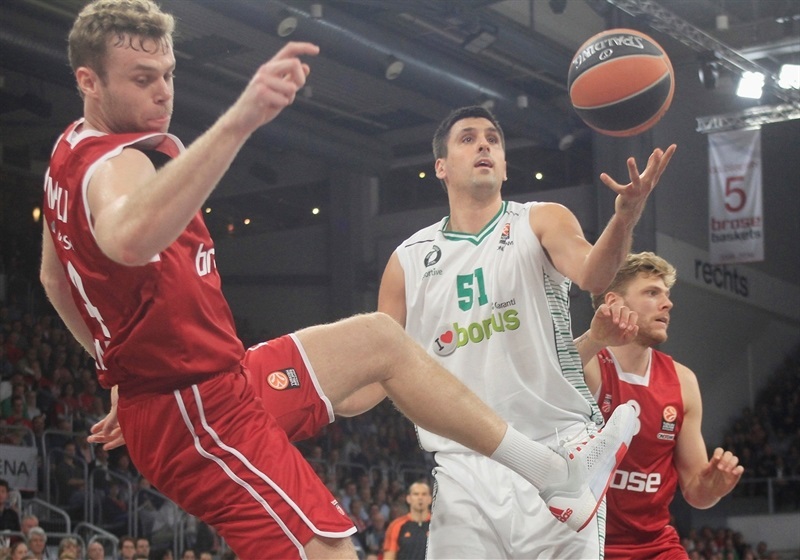 Slowly Darussafaka chipped away at its deficit. Redding made 1 free throw and Slaughter added 2. Bjelica’s dunk made it 55-45. A jumper by Gordon drew Darussafaka within 9. But Staiger hit a tough jumper. After Slaughter netted 2 free throws, Miller and Ender Arslan traded triples. Staiger buried a long triple and Arslan sank free throws. Redding got to the line and closed the difference to 8, but Strelnieks beat the buzzer to end the quarter at 67-56. Melli drained an open foul-line jumper to the delight of the fans. 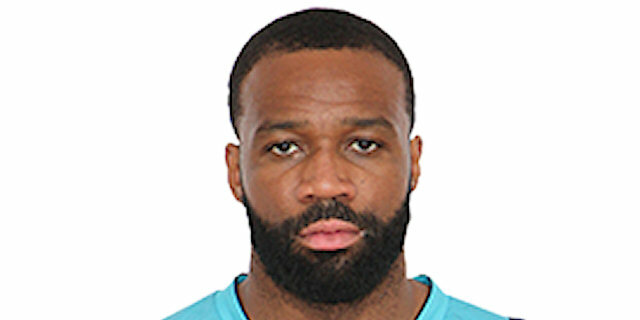 Arslan and Strelnieks traded threes. Strelnieks third triple of the game made it 75-59. After a timeout, Preldzic showed his soft hands with a fade-away jumper. 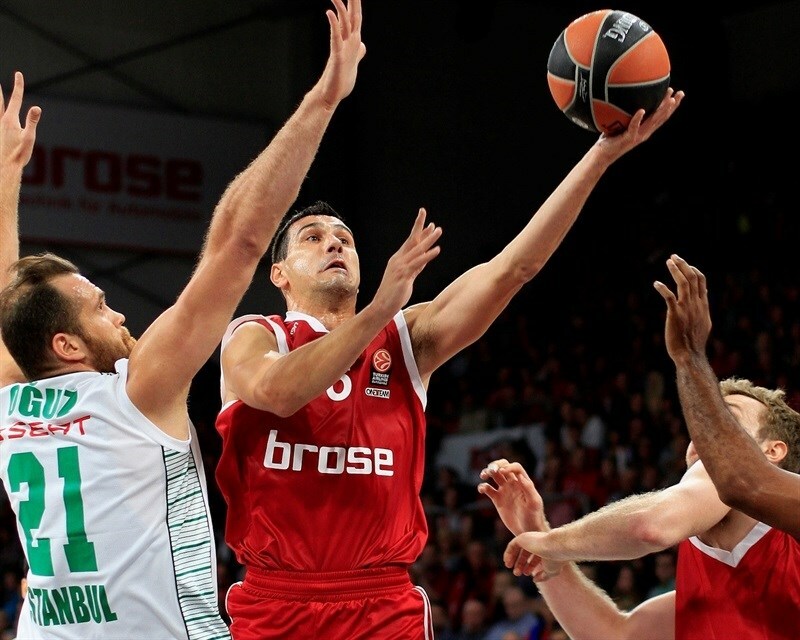 After Bjelica split free throws, Melli’s tip-in made it a 17-point game. Free throws by Bjelica and Erden did little to threaten the outcome. Bjelica added two more baskets, though Wanamaker made a tough layup in between. Wanamaker’s next layup – and the free throw that came with it – all but wrapped up the victory with time to spare. 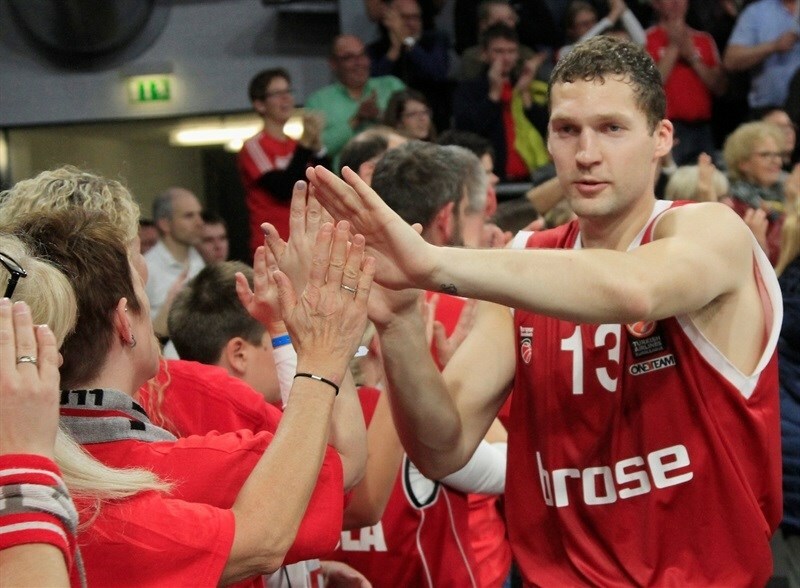 "The philosophy for us for this game was to play a team game and try to bring back a W in the Euroleague to Bamberg. This is a very tough group and every point can count. I believe that we played with great energy. We played as a team. Everybody was important. Daniel [Theis] and Elias [Harris] are very important to create a lot of movement, a lot of energetic plays. Lucca [Staiger] gave us a lot in clutch moments. Nikos [Zisis] was really experienced and always in control, played excellent pick-and-roll offense. He had a really good feeling with Elias and Theis on pick-and-rolls. If I have to be very straight, I didn’t like the second half defense. We allowed 49 points. But I can be angry, and I am, but this is very logical. Only three players had kind of Euroleague experience. Even though we told them that every point counts, some of our rookie players in the Euroleague just got loose at some moments in the second half. But we had a great push from the home crowd. And we always have good offense. Ten points is better than a 9-point win, but it’s worse than 11. " "The first half we started really poor on offense - 15 turnovers and no fast break. In the second half we had more rhythm and we came back in the third quarter, but they hit difficult three-pointers and that gave them confidence. In the end we lost by 10 points. " "We just wanted to come out and play with a lot of energy. We knew that they have a really experienced team, a big team and just try to play harder than them. We knew if they got into a groove and played how they wanted to that it would be a really tough game for us. It worked out. " "We came out and played soft. We didn’t play tough enough on the road. Credit to Bamberg. They came out tough, hit shots and executed. Basically they did anything they wanted. We gotta play tougher. We have to impose our will. We have to use our size and our toughness. We just can’t come out and play like this."